Just like having a our Guide in your car! Don't miss out on the best sights during your visit to Yellowstone National Park. Plays commentary as you drive No Data or network connection required. Works offline Prepared by Professional our Guides 300+ commentary points Fraction of cost of bus tours or guide books urn your iPhone or iPad (WiFi + Cellular models only) into a our Guide and take your driving tours and sightseeing to a whole new level with the GyPSy Guide our of Yellowstone National Park. Commentary plays as you drive so you don't miss any of the best sights and stories along the way. his tour includes the most popular sightseeing areas 1) Old Faithful and the incredible Geyser Basin reas 2) he Grand Canyon of the Yellowstone rea 3) Mammoth Hot Springs 4) West humb and the Lake area 5) ower Fall and Roosevelt area 6) Many wildlife spotting opportunities Let GyPSy be your guide everywhere around the Grand Loop Drive of Yellowstone National Park. GyPSy will help you work out the best places for you to visit by giving you helpful information so you can make good decisions and make the most of the time you have available. Join the tour anywhere along the Grand Loop and commentary will play automatically so you won't miss a thing as you explore all around Yellowstone. You can drive in either direction its your choice. his app works while you are touring. here is no need to have a network or wireless connection. Once downloaded, this tour to operate and activate, so you won’t incur roaming or data charges. You will not incur any data roaming charges to use this tour, even if you are from outside the Works Offline and with Data Roaming turned off. Professional tour guides have filled the guide with interesting and entertaining stories, loads of tips and advice on what to do and will point out places of interest as you approach them. here are 302 commentary points throughout Yellowstone. It’s just like driving around with a local expert. Just download the app on WiFi from your network at home or use any free WiFi network. Because the app is filled with audio commentary and maps, its larger than "normal" apps. Many phone/data networks will block the download because of size so its important to download over a WiFi network. his tour is not just a directory but a designed tour to follow, just like how a tour guide would take you. It’s simple and entertaining; just let GyPSy provide commentary automatically as you travel. iPad users please note that WiFionly iPads will not activate the commentary automatically. ny iPhone or networkcapable iPad (WiFi + Cellular whether you have a network connection or not) will work just fine. ++ Continued use of running in the background can dramatically decrease battery life. Check these links to find your download for Yellowstone GyPSy Driving Tour for & iOS or for your device iPod TouchiPadiPhone. 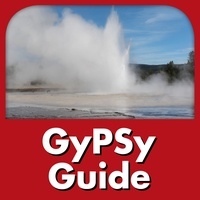 The app Yellowstone GyPSy Driving Tour is compatible with te following devices.